Nathan Hill’s acclaimed novel ‘The Nix,’ includes a Trump-like protagonist, reminding us of this new era of fake news and alternative facts. The acclaimed novel was one of last year’s most talked-about books, with many critics noting its “Trump-like” Republican presidential candidate Gov. Packer—a character Hill created years before Trump ran for office. And its splashy debut came at a time when fiction was showing signs of a new resurgence; in its overview of 2016 book trends, the Los Angeles Times declared, “Long-form nonfiction is in peril.” The sudden rise of George Orwell’s dystopian classic 1984 to bestseller lists was widely noted, but the Atlantic and the BBC looked deeper into the trend to discover that the Trump era seemed to be elevating sales of other fiction, as well. Before that, Hill had been living in Queens, toiling away on short stories to land the usual prestige publication credits, when he decided to move to Florida and start fresh. Writers need other writers, but squeeze too many of them into your consciousness and it’s like packing an elevator with too many overdressed men who have hit the man-perfume way too hard. Getting away clearly did wonders for Hill’s talent. Not everyone would feel comfortable building a 625-page novel around a main character, Samuel Andresen-Anderson, who is just sort of there. He’s no hero, no anti-hero, and the main things we know about him are that even into adulthood he lives in constant mortified terror of slipping into a crying jag, which he breaks down into categories like storms; that he teaches, but kind of hates it; and that his mother abandoned him when he was young. Oh, and he’s a writer, or sort of a writer. Much as Northern California writer Emma Cline used her novel The Girls to breathe new life into our understanding of one aspect of the 1960s—the charismatic allure of a Charles Manson–type figure—Hill uses this story about a son in search of a vanished mother to papier-mâché together a shockingly vivid reimagining of the famous clubbing of protesters by overzealous Chicago police that will always be associated with the 1968 Democratic Convention. Hill slows down time in a way that mesmerizes. He takes a reader used to thinking about shorter attention spans and quietly changes the subject. For the right book, page count doesn’t matter; quality does. 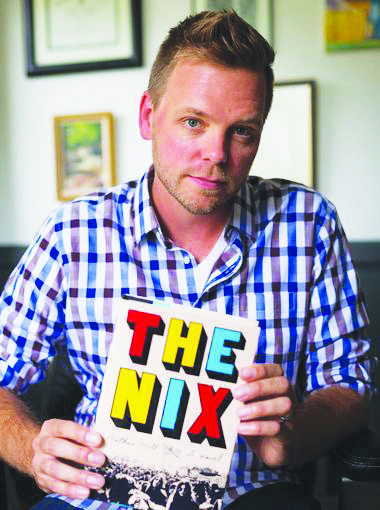 Nathan Hill spent 10 years writing his book ‘The Nix’ without worrying what others would think about it. sons, looking like a bad-hair outcast from a remake of the cheeseball TV show Dynasty, went on Fox News in early June to share the opinion that, to him, Democrats are “not even people,’ the natural first reaction was to snicker at the sheltered cluelessness of this son of a son of privilege, this epic lack of understanding of anything other than his deranged father’s rants. This, I think, is the ultimate thrill of reading Nathan Hill: Having the sense of getting to know people we’d thought were walled off from us. His baton-swinging cop, for example, is a tour de force, human and sad, so much so that I for one almost felt like I was identifying with him even as he slammed protesters in the head with that baton—well, at least for a moment or two. The point is simply to turn back from the glibness of hate or bias to what we are born knowing, that what unites us is stronger and vaster than that which divides us. Reading Hill, I’m thinking that some young novelist out there with flash and nerve is going to find a way to build a fictional tunnel from the present to 1969 California, when an actor in the Governor’s Mansion in Sacramento ordered the National Guard into Berkeley to crack down on protesters who wanted to turn a scruffy little vacant lot owned by the state into a People’s Park. James Rector of San Jose, an innocent bystander, was killed in the melee, and the silent majority rallied behind Reagan and his show of force. He rode the tough-guy-on-a-horse image all the way to the White House. But like Chicago in ’68, it’s all become a cartoon. Only a great novelist can really reclaim that kind of territory for us, as Hill has done in The Nix. The book was published in hardcover before last November’s election (it’s newly out in paperback), which seems oddly fitting. Post–Trump election, like post 9-11, the fiction writer feels a tidal wave of pressure to try to do something with the flotsam and jetsam of what used to be a culture. It’s overwhelming, which is why if you follow writers’ social media feeds you read much in November and afterward about people who couldn’t get out of bed for days or weeks on end. It was paralyzing. The joke was also a kind of homage to fellow novelist Michelle Richmond. Back in 2009, when she was working on the project that would become the novel Golden State, Richmond was going for outlandish but not too outlandish when she sat down to write a scene about Californians going to the polls to vote on seceding from the United States. “I really want to take the time with my own political feeling and political thinking,” he told me on the phone. “I don’t want to make snap judgments. For example, as I write my next book, it’s really tempting to try to deal with the age of Trump, but I don’t think that would make a very good book. It’s too new. I don’t have enough distance from it yet. And frankly, I’m not incredibly confident about my own opinions.